Carolina Solar Security is the area’s largest and most experienced 3M™ authorized dealer and applicator of high-performance window film. We’re locally operated and veteran-owned. We employ professional, 3M™ trained window tint installers that live right here in our community. We do not send contract workers into your home or business, only courteous and respectful installers. Since 1985, Carolina Solar Security has guaranteed satisfaction, from the free consultation to the final installation. We take a consultative approach to finding the best solution to save on energy bills, protect your family or your assets, or create a comfortable environment. 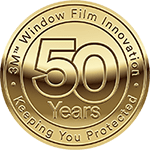 Our wide range of window tinting products includes sun control films, safety & security films, and decorative films that vary in color, tint density, and heat rejection capabilities. With UV rejection as high as 99.9 percent and infrared rejection up to 97 percent, our films reduce the two leading causes of fading. You can rest easy with professional installation of 3M™ window films and 3M™ window tinting by Carolina Solar Security. We provide a complete analysis of every window, test film samples in your space, and create a no-obligation proposal. Our professional installation qualifies you for a full factory 3M™ warranty and a performance guarantee.